Hilda and Emily Demuth standing in the pasture of the McEachron homestead. 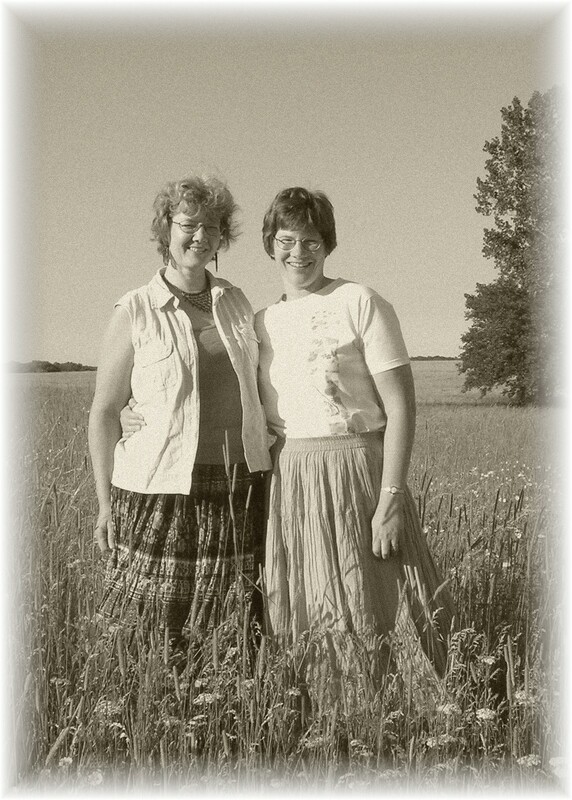 Hilda and Emily Demuth grew up with their brothers and sisters on the old McEachron homestead in Yorkville Township, Wisconsin, where the Plank Road books take place. Hilda and Emily credit their parents for instilling in them a love of reading, an appreciation for country life, and a commitment to community. Both sisters are graduates of Valparaiso University. Hilda Demuth-Lutze, a high school English teacher, lives in a farmhouse in Northwest Indiana with her husband and children. When she is not grading papers or working with wool, Hilda enjoys playing in a contra dance band called the Hoosier Recruits. Emily Demuth Ishida lives in a suburb of Chicago with her husband and children. She spends her days as a grade school library aide and computer lab assistant, surrounded by children and children’s books. Emily has done free-lance writing for many years, primarily devotionals, curricula, and global education resources for the Evangelical Lutheran Church in America and Augsburg Fortress Publishers. She is a regular contributor to The Little Lutheran and The Little Christian. Our youngest sister, Gretchen Demuth Hansen, took the photo of us in the pasture. It has become the “Plank Road Summer author photo,” appearing in newspapers and on bookstore websites. We want to thank her for her artistic eye that captured the image. Love the site! Looking forward to the book. Congrats, Emily! Enjoy your active summer. I have been waiting for this day to happen! Congratulations to both of you. As a former Plank Road resident, I can’t wait to read the book. I am so pleased that all your faith and hardwork has been rewarded. My family and I are proud to share in the excitement of this book for my great grandfather, George W. Acklam was one of the original toll keepers in Racine, WI. for the Wilmot Plank Road. We all want copies to pass down through the generations !!!! Thank you so much for making the importance of the Plank Roads available to readers, young and old. I can’t tell you how fun the booksigning/Old Time Dance/Yorkville reunion was! I am reading the book right now and am enjoying it immensely! I plan to take our children on a tour using the map at your “Resources” link. Though we lived n the Plank Road quite a bit after its planks were gone the memories are very vivid. Enjoy this fun, exciting time ! Hope to see you later this summer!! Hilda and Emily, I had the good fortune to speak with your mother at the services for Bob Krielkamp. It was a wonderful trip down memory lane with her and along the way she mentioned her author daughters. Although I didn’t have personal contact with you when I was principal of Yorkville Elementary School I still take pride in the fact that the two of you have accomplished so much. My next step is to obtain a copy of Plank Road Summer, stretch out and enjoy what I know will be an interesting read. I remember you as principal during my Kindergarten and first grade years at Yorkville. I got sick at school one day, and was sitting in the office waiting for Mom to pick me up. You walked by and gave me two M & Ms. Though M & Ms are one of my favorite things in the world, my stomach was so upset that I did not eat them. Contrary to their advertising, the M &Ms melted in my hands. Yet after alll the years, it is the kindness of my principal that stays in my mind.